This game was the first that I looked for when the fixture list came out as it would be my only opportunity to visit a new ground in the league. Most of my away travelling was done in the late 80s and in the last 10 years, so I have not previously had an opportunity to go to the Stadium of Light. My abiding memory of a game away to Sunderland is of sitting in a hotel room in San Diego looking at a stunning view of the Pacific with tears running down my face as I wished I was in Sunderland with my sister for the FA Cup game with the twice taken Tommy Smith penalty. I had booked a ridiculously early train to Sunderland via Newcastle and thought I would probably be alone, but that was far from the case as I saw a number of yellow clad people at Kings Cross. I had arranged to meet the Hebden/Bradford massive for pre-match drinks in Newcastle, but arrived too early for the pub of choice to be open so I went for a walk into town until the cold rain drove me into an alternative hostelry for an early lunch. At opening time, I headed across the road to join the queue (of 3) to get in and grab a comfy berth. Needless to say, it was considerably quieter than when Newcastle are at home, but all the locals were friendly and wished us a lovely afternoon and to leave Sunderland with 3 points. The pub had a proper record player on the bar on which they started playing some Christmas tunes, but soon got bored and reverted to some 60s classics, which made me very happy indeed. The trip up to Newcastle had been in rain but, as we left the pub to get the metro to Sunderland, thick snowflakes were falling and there was some questioning of whether the game could be in jeopardy, the conclusion being that undersoil heating meant that was unlikely. After entering the Stadium of Light we found several flights of stairs to an away end that is not quite as high as Newcastle’s but not far off. The trip up was made easier by the entertainment provided by a string of football related quotes. 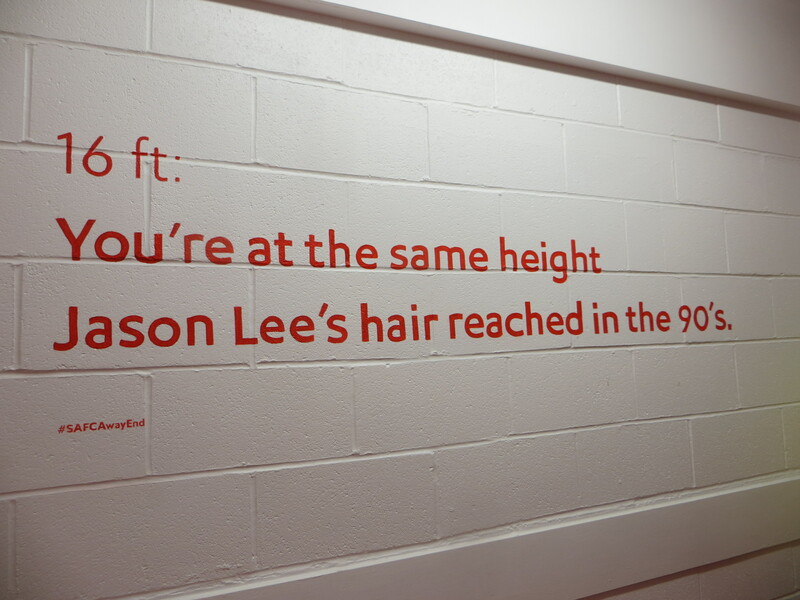 For Watford interest, there were references to GT, Ronnie Rosenthal and Jason Lee. It made me smile through the exhaustion. Team news was that there was one change from the win against Norwich as Abdi came in for Anya. So the starting line-up was Gomes, Aké, Cathcart, Britos, Nyom, Watson, Capoue, Jurado, Deeney, Abdi and Ighalo. Watford had the perfect start to the game, taking the lead after 4 minutes. In real time, I thought that Ighalo had missed Nyom’s cross and the keeper had turned it in, but I was doing Odion a grave disservice as the ball had been poked goalwards and what I saw was it going through the goalie’s legs. Whoever had provided the final touch, it was Ighalo’s battling presence that led to the goal. Happily there was some early bouncing in the away end. Watford continued in this positive manner as a cross from Aké dropped to Abdi, whose shot was blocked for a corner. I am still shaking my head at why the next passage of play didn’t result in a goal. Ighalo got into the box and beat O’Shea before hitting a shot that was blocked, his follow-up appeared to be going in but was cleared off the line, then Abdi tried a shot that was blocked, finally Jurado’s shot hit the post. There were heads in hands in the away end. We had started the game very well. 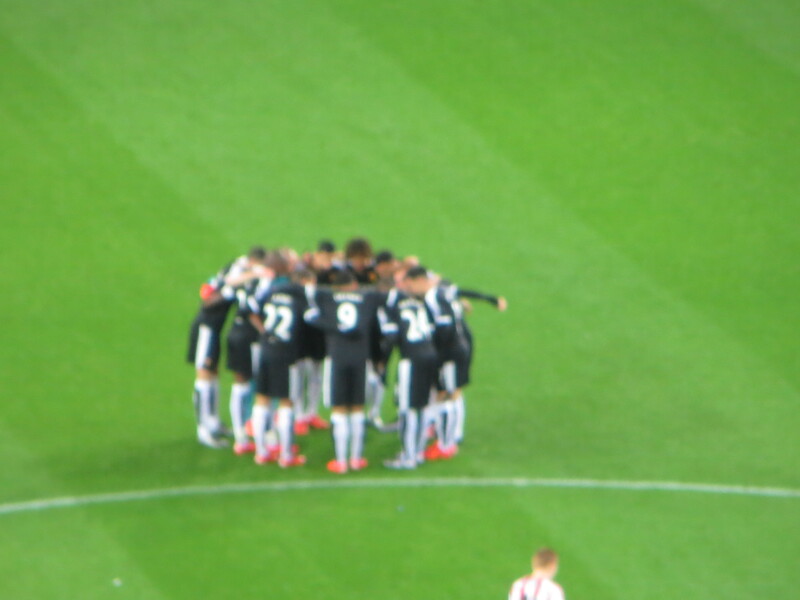 Apart from the goal, the lads had been playing the ball around in a very composed manner. It was looking very impressive, but why weren’t we two up?! The home side had their first shot on goal in the 14th minute, but it didn’t trouble Gomes as Jones wellied the ball high and wide. Their next chance came soon after and was much more dangerous. Deeney lost the ball to M’Vila who played a lovely ball to Borini, but his shot flew wide of the far post. Sunderland made an early tactical substitution replacing Yedlin with Rodwell. Watford’s impressive play continued with a lovely cross-field passing move which resulted in Nyom having the ball in space on the right, he started to advance upfield but got bored and launched a shot from a mile out that was well over the target. I love you, Allan, but Why??? Ighalo nicked the ball in the midfield and passed to Abdi who crossed for Capoue whose curling shot required a good save from Pantilimon. Then Abdi lost the ball in midfield, but he and Watson were soon back to snuff out the danger. Another dangerous break by Sunderland was briefly interrupted as Aké was back to block the cross for a corner. Gomes came to meet the corner, but his punch reached Borini who shot well wide. The home side had a great chance to equalize just before half time as a M’Vila free-kick appeared to be flying in when Gomes made a really good save to keep it out. I was puzzled at half-time to see that Sunderland had no shots on target, until I found out that the ball had been flicked on by Britos. The last action of the half was another chance for the Hornets. Jurado appeared to be in a good position to shoot, but passed to Deeney who needed time to position himself and shot wide. At half time, Watford were well worth the lead but there was frustration that we hadn’t got a second goal. The first action of the second half was a shot from van Aanholt that flew wide of the target. Watford also had an early chance as Ighalo got on the end of a cross from Nyom to head goalwards, Pantilimon made the save, but the flag was up anyway. The positive part of that move was seeing Ighalo beat his man, as he had spent a lot of the first half being frustrated by the attentions of the Sunderland players. At the other end a Cathcart clearance only went as far as Fletcher, but the Irishman redeemed himself getting into position to block the shot. Gomes was then on hand to punch a shot from Rodwell. There was another substitution for Sunderland as former Watford loanee, Adam Johnson, came on to replace Borini. He was booed by many in the away end and then received sustained abuse relating to his upcoming trial. The only yellow card of the game went to Rodwell who was booked for a nasty tackle on Watson. Just after the hour mark, the home side’s decision to take a free kick quickly backfired as the ball was passed straight to Ighalo but the Nigerian was knocked over before he could do any harm and the referee, who I credit with letting the game flow, didn’t see a foul. Rodwell got the ball on the edge of the Watford box but his shot was high and wide. The home side took a very poor corner and the ball broke to Ighalo, who went haring up field but the break came to nothing as he played a poor pass towards Nyom. Watford’s first substitution saw Guedioura come on to replace Abdi. The nerves in the away end became even more frayed as Allardyce made his final substitution replacing Fletcher with Defoe. He almost made an immediate impact as he latched on to a through ball from Johnson and fired it past Gomes. Thankfully the linesman raised his flag and the goal was disallowed. Flores made a second substitution replacing Jurado with Anya. New graduate, Watmore, came close to scoring an equalizer with a shot that curled just wide. Watford broke forward again as Aké released Ighalo, but a defender was snapping at his heels as he ran into the box, which was enough to put him off his shot so Pantilimon was able to block. 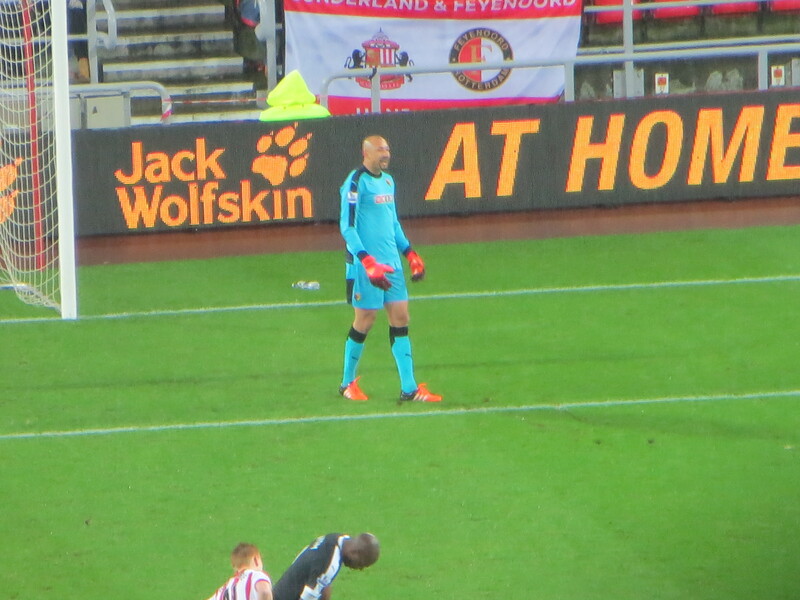 At the other end, Gomes was called in to action pulling off a great diving save to keep out a shot from Defoe. With 10 minutes remaining, Capoue released Ighalo but Coates got back to block his shot. Despite the early goal, it was looking like it just wasn’t Odion’s day. At the other end, a cross from van Aanholt was touched just wide by Defoe to the great relief of those in the upper tier behind the goal. Gomes then added to the jangling nerves by delaying picking up a ball into the box, he didn’t see the Sunderland player approaching and ended up having to grab it. Watford nearly killed the game off as Anya played the ball back to Guedioura who hit a lovely curling shot that was pushed clear. There was another assault on the Watford goal that finished with Johnson shooting wide of the far post. Then Guedioura advanced down the wing and played the ball back to Capoue who moved it on to Deeney whose shot was deflected for a corner. As we approached time added on, it baffled me to see so many Sunderland fans leaving. I was far from confident that we would win the game. There was a final scramble in the Watford box that finished with a block from Gomes and then Watson making a strong clearance. The final attack of the game came from the visitors as Deeney released Ighalo, who appeared to be a mile offside, but we were not to have another late goal as the shot was saved. When the final whistle went, it was clear that the relief on the pitch matched that in the stands. On the way out of the ground most of the conversation was about how Deeney and Ighalo had both had off days. There had been plenty of positives about the performance but the two of them seemed to be muscled out of the game. That was followed by the reflection that successful teams are those who win when they are not at their best. The third stage was the grins as we reflected that we were seventh in the table and had already exceeded our points total from 99/00 after 15 games. When my friend showed me the table at the end of the game, my initial reaction was that the table at 5pm on Saturday can be misleading. I am writing this after the games on Sunday and we are still seventh and go into the Liverpool game above them in the table (and above Everton, West Ham and Chelsea). Wow, just wow!! We now go into a difficult run of games, but we can go into them with some hope of points and, if the worst happens, we have a decent cushion to tide us over. Who knew the Premier League could be fun! This entry was posted in Watford FC and tagged Adam Johnson, Adlene Guedioura, Allan Nyom, Almen Abdi, Ben Watson, Billy Jones, Costel Pantilimon, Craig Cathcart, Deandre Yedlin, Duncan Watmore, Etienne Capoue, Fabio Borini, Heurelho Gomes, Ikechi Anya, Jack Rodwell, Jermain Defoe, John O'Shea, Jose Manuel Jurado, Miguel Britos, Nathan Ake, Odion Ighalo, Ola Toivonen, Patrick van Aanholt, Quique Sanchez Flores, Sam Allardyce, Sebastian Coates, Steven Fletcher, Sunderland AFC, Troy Deeney, Watford FC, Yann M'Vila on December 13, 2015 by franelynn. Thanks again Frances, a super reminder of an altogether very strange day out.